An official endorsement likely would have helped Moore with some of his campaign troubles. The White House announced Monday that President Donald Trump will not be hitting the campaign trail for Senate GOP candidate Roy Moore ahead of Alabama's special election on Dec. 12. Last week, Trump defended Moore against allegations of sexual misconduct with teenagers. Trump said he'd announce later whether he'd actually campaign for Moore. Press Secretary Sarah Huckabee Sanders said Monday, "The president is not planning any trip to Alabama at this time, and frankly, his schedule doesn't permit him doing anything between now and Election Day." 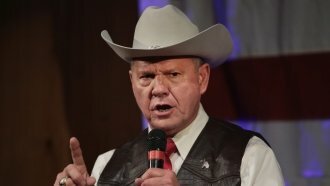 Alabama Republicans do largely support Moore. But a Trump endorsement likely would have helped offset some of Moore's troubles. The misconduct allegations helped give his opponent Doug Jones a solid financial advantage: Millions of dollars' worth of online donations have flooded into his campaign, and Jones has spent more than $5.6 million in TV ads. Moore has spent about $800,000.